DETROIT (Reuters) -- Takata Corp. said today it plans to boost production of parts needed to replace potentially deadly airbag inflators that could spray vehicle occupants with metal shards. 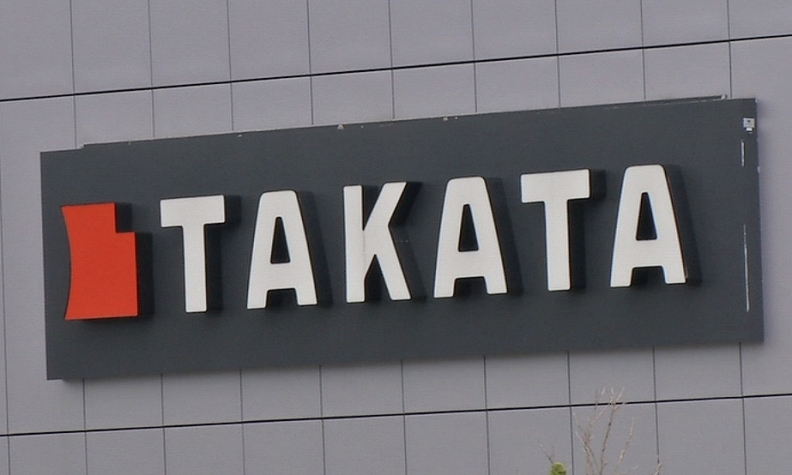 On Tuesday, federal regulators doubled the U.S. recall of defective Takata airbags to nearly 34 million vehicles from 11 automakers, potentially making it the largest industrywide recall order in U.S. automotive history. Takata's airbag inflators have been found to explode with too much force, spraying metal fragment inside cars and have forced automakers to recall more than 53 million vehicles worldwide since 2008. The component has been linked to six deaths, all in cars made by the supplier's top customer, Honda Motor Co.
A Takata spokesman said the company will boost output of the replacement parts to 1 million inflators a month by September, an increase of 100,000 parts from the previous forecast and up from the current monthly level of 500,000. He did not specify if all the additional production would be added at Takata's inflator plant in Monclova, Mexico. Takata said in February it would double production to 900,000 inflator kits by September from 450,000 parts at the time. The Takata spokesman said the company had just passed 3.8 million replacement kits made in total. On Tuesday, Mark Rosekind, administrator for the U.S. National Highway Traffic Safety Administration, said he did not know how long it would take to complete the Takata recall. "There is no question, it could be some years," he said. Takata and NHTSA, which has hired independent research group Battelle to uncover the technical cause of the problem, said the priority for the replacement parts will be older vehicles and those in higher-humidity regions. Takata and its customers will determine who receives the replacement parts, but NHTSA is overseeing the process and could issue orders to the companies involved. But Kevin Pollack, vice president for Stericycle ExpertSolutions, which is helping some of the affected automakers, said the complexity of the recall could play out over at least two years. "There weren't 30 million extra airbag inflators sitting around." Jack Gillis of consumer advocacy group Consumer Federation of America believes the recall could take up to five years to resolve. General Motors said last December it had developed contingency plans to deal with a potential shortage of replacement parts, including directing Takata to share inflator specifications and data with rivals Autoliv and TRW so that any replacement parts would work in GM vehicles. A GM spokesman said today there was no update on those plans, but it was doing extensive testing. Autoliv said today it was ready to boost production capacity to meet increased demand for replacement airbag inflators needed in the Takata recall. The Swedish company said in January it was targeting additional production capacity of up to 25 million airbag inflators for delivery in 2015 and 2016. Autoliv spokesman Thomas Jonsson said today that the company is building replacement inflators for Honda and several other unidentified automakers, but he had no sense of how long it would take for the industry to meet the demand for replacement inflators. Honda spokesman Chris Martin said the company is also using Japan's Daicel Corp. and TRW for replacement inflators. TRW was recently acquired by Germany's ZF Friedrichshafen. "We absolutely have back orders on inflators," Martin said. "Some people may wait a couple days, some people may wait a few weeks." Daicel said in February it would build a second U.S. plant for airbag inflators in early 2016, bringing forward plans partly to meet demand for alternatives to Takata's potentially deadly inflators. It said the previous month it would boost output of replacement inflators in Japan. A Toyota Motor Corp. spokeswoman said the company is working with Takata for most replacement inflators, but will use Daicel for some parts. A spokesman for Nissan Motor Co. said that the company would not comment about supplier selection or potential negotiations. Ford Motor Co. has previously said it has spoken with Takata rivals about buying replacement parts. Last November, BMW disclosed Takata would shift inflator production for the German luxury automaker's vehicles to the Japanese supplier's plant in Germany from its factory in Mexico. Not everyone is disappointed with the expanded recall, however, as consumer advocate Gillis said dealers will see a "gold mine" with increased visits to their repair bays and a possible boost in new-car sales as a result.